It's been a tough summer for drought in the United States and the latest news isn't going to make it it any better. Because it turns out that it's not just the surface that's drying up. There's a drought happening underneath us too. It&apos;s now just as likely for an area of the U.S. to be in drought as not. 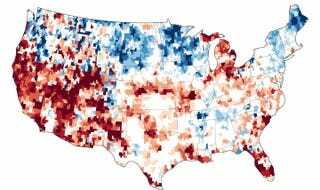 The map above, which was put together by NASA's Earth Observatory, charts currently available groundwater supplies in comparison to the typical amount of groundwater present at this point in the season over the last 60 years. Red signifies an usually low level of groundwater in comparison to the usual level, while blue means either average or wetter conditions. There are, however, one or two anomalies, mostly in the Pacific Northwest, where despite conditions so dry that wildfires have been a continuous problem, groundwater supplies still show as more plentiful than usual. Unfortunately, the reason for the contrast may simply be due to slower movement of drought underground and not a real symptom of relief.